Take along these vibrantly, stimulating Chewbead teethers when you’re on-the-go and you’re little one is still teething. These too-cute teethers are made of silicone beads that are strong and firm with just the right amount of give to calm babies sore teething gums. The elastically firm design offers multiple textures and appealing bright distinct colors that are guaranteed to entice your infant’s attention. 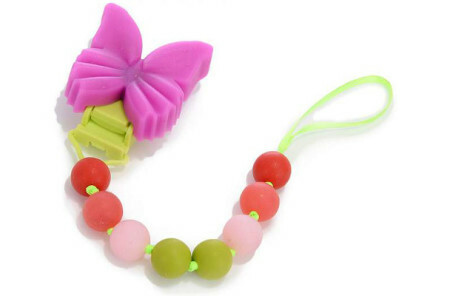 Chewbeads Teethers come in Pink / Chartreuse, Turquoise / Orange, and Grey / Yellow. These Teethers are non-toxic so they’re safe for baby and are dishwasher safe.